Absolutely News. Absolutely to be released on DVD ? All the very latest news relating to the release of Absolutely on DVD. There is a Benefit gig in London that will feature two of Absolutely's Stoneybridge town council members on Saturday 17th November 2012 at Hampstead Town Hall, London. Brucie and Boaby from Channel 4's Absolutely will host "The Stoneybridge Ceilidh" That's Gordon Kennedy and Peter Baikie ! You can also see Pete Baikie perform in the Glenbuck Cherrypickers! Gordon, Moray, Pete and Morwenna will be in Zavvi (formerly Virgin Mega Store) on Buchanan St, Glasgow Thursday 8th May from 5:30pm. So go along and meet them in the flesh ! Watch the 10 min teaser video HERE. And read how and why HERE. The Absolutely DVD box set will be released Monday 28th April 2008, Yes really. Just announced on www.absolutely.biz that Absolutely Productions have aquired the DVD Rights in a deal with Channel 4 International to re-aquire the ditribution rights to all 4 series of Absolutely. They hope to announce more news on the Absolutely DVD soon. Virgin Media are showing the first three series of Absolutely as part of their "On Demand" service. Almost all the shows are free to watch (some are 49p). These will be available for the next three months. This service was formally known as Teleport TV on Telewest. John Gordon Sinclair stars in a new comedy pilot. Barry - a useless, lazy, spaced out young man. His other main difficulty in life centres around sacking Muriel, who runs the café attached to the bureau and is also possessed by the spirits of deceased Strathmuir residents, and how he can replace her with Sheena. Sheena is an over-ambitious, misguided young woman - just out of college and back from the bright lights of Glasgow - wanting to prove how far in the world she has come from when she left the small town of Strathmuir. Andrew calls on the help of the village lawyer, Deepak, for guidance on how he can resolve his problems before Deepak leaves Strathmuir to sail the Seven Seas. Andrew is played by John Gordon Sinclair, Barry by David Kay, Muriel by Morwenna Banks, Sheena by Gabriel Quigley, Rev. Sterne by Jack Docherty, Sheena’s Dad by Moray Hunter and Deepak by Nitin Ganatra. 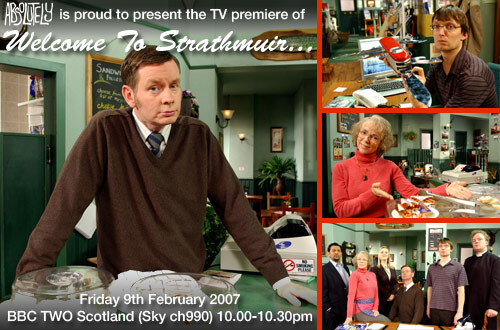 Welcome to Strathmuir is also written by Moray Hunter and Jack Docherty. Article in Daily Record HERE. The DVD box set is coming soon ! Important news read now ! My online petition to get Absolutely repeated/released on DVD was passed onto both Channel four television and Absolutely Productions ltd in the summer of 2005. At the time of passing on my petition, there were 163 comments from people. Today (Feb 8th) there are 541 petition comments ! "I contacted Absolutely Productions and got a message back from Gordon saying they are hoping to release it on DVD very soon, why don't you mention this on your site?" "Do you have any news about a DVD release as you don't seem to be saying what is happening with regards to this." "Have you contacted Absolutely productions to see if they are releasing it soon on DVD?" The statement from Gordon Kennedy as of Feb 8th 2006 is..
Lastly and perhaps most importantly can I thank you and everyone who has emailed us at absolutely and signed up to your petition on your great site. We were all completely gobsmacked that there were so many fans out there wanting this DVD and it has been a huge help in all of our dealings with distributors. We would not be at this stage without all of you so many many thanks from the whole team." So there you have it, Please be patient and a DVD release will come. You have waited for fifteen years so I'm sure you can wait a bit longer for it! In the meantime please do sign my petition as any potential distributor would need to see that there is indeed a demand for this comedy series to be released in full.